One of the problems with trying to get a gig in the entertainment industry is that it tends to make watching popular television remind you of the work you're trying to get away from. That's probably why I've been watching so much Daniel Boone lately. Daniel Boone is a 1960's adventure show following the exploits of the frontiersman. The show airs on World Harvest Television (WHT) a station whose two goals seem to be to get you to give money to God (you can just mail it to them since they're nice enough to pass it along) and to get you to buy the expensive supplements sold by a vitamin company who seems to be the station's only real advertiser. A great part of the show actually comes beforehand when an announcer tells us: "The Following Program is an educational informational program designed to reach children 16 and under." I'm not under 16 years old, but if WHT is trying to reach me via Boone's exploits of spying on pirates, pretending to be a ghost in a haunted house, and hunting enough meat for the season, then consider me reached! 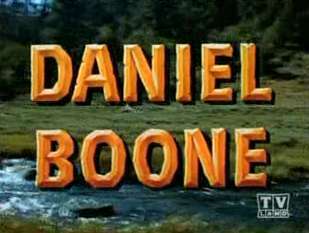 As the words are sung, Boone throws an ax, which splits a tree and shatters it to spell the words "Daniel Boone". Talk about a big man! I'm not sure he's as big as a mountain, but I've got a pretty good idea he's taking those fancy vitamins World Harvest is selling.